We often think of exfoliation as being just for the face, but the rest of your body needs exfoliation, too. The question is what to use: Is an exfoliating body scrub the answer? A loofah? A body brush? We go over the do’s and don’ts of body exfoliation, and explain why the best body exfoliator is one you leave on your skin. You might be wondering why we should exfoliate. With age, accumulated sun damage, and certain skin issues, skin’s natural ability to invisibly shed dead surface cells becomes faulty—sometimes stopping altogether. The result is a buildup of dry, ashen-looking skin that can make your arms, elbows, legs—pretty much everywhere—look dull, uneven, and older than they really are. Should You Use a Body Scrub? 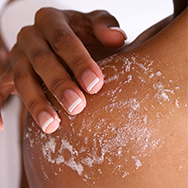 The cosmetics industry traditionally offers one type of product as a solution: body scrubs. You’ll find scrubs that contain different types of exfoliating ingredients, from polyethylene (also known as plastic microbeads, which are being phased out due to environmental concerns) to walnut shells, pumice, volcanic ash, sugar, and sea salt. Which scrub is best? Surprisingly, none of them! The best body scrubs are the ones you don’t use. With very few exceptions, almost all body scrubs are too abrasive. They exfoliate, but at the expense of causing tiny micro-tears in skin. This gradually erodes your skin’s protective barrier, leading to dryness, sensitivity, and other problems. Body scrubs also are often highly fragranced, including with essential oils, and these cause further issues that can trigger irritation (although they do smell good, which does make them tempting). Loofahs and dry body brushes are no better; in fact, their rough, too-firm textures and mode of use can make them even worse than scrubs, leaving skin redder and rougher than it was before. What should you use to exfoliate your body? Research has made it clear: The best body exfoliator comes in the form of a leave-on AHA (alpha hydroxy acid) or BHA (beta hydroxy acid) exfoliant. When well formulated, these exfoliants gently dissolve the bonds holding dead skin to the surface, revealing the fresh, healthy-looking, bump-free skin beneath. Use an AHA body exfoliant that contains glycolic or lactic acid to improve the look of dry, crepe-like, sun-damaged skin. AHAs also help enhance skin’s ability to hold on to vital hydration and promote visibly firmer skin, like no body scrub ever could. If your skin from the neck down is prone to clogged pores, blemishes, and redness, or is rough and bumpy, look no further than a BHA body exfoliant that contains 2% salicylic acid. Once- or twice-daily application will make a world of difference we suspect you’ll find remarkable. You can consider gentle, fragrance-free body scrubs as a way to deliver extra cleansing to skin, but not as a solution for the many body-care concerns that leave-on AHA or BHA exfoliants so beautifully address.